Among my projects this week were more dye work and piecing a quilt. Both reminded me of the never-ending voyage of learning that we are on through life. In the piecing of my quilt from Sandy Turner’s workshop, I learned something about one of Bernina’s feet that I never quite grasped before…..I have had the 34D as long as I have owned my machine but it was in piecing my “Wildlife” quilt that I really ‘discovered’ those tiny red lines. Piecing the Birds in the Air blocks required a certain amount of precision and I was delighted to learn that if I began with horizontal lines in line with the top of the fabric and the edge indented to the inside of the right horizontal line, I was usually in a perfect starting position. Further, I could simply keep the edge of the fabric in line with that inside right horizontal line and have a great 1/4″ seam. 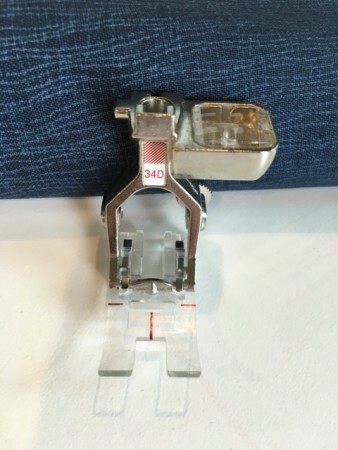 Previously, I had been focusing on keeping my fabric lined up with the 1/4″ line on my foot plate. This simple discovery on my part increased my precision dramatically and also my speed. Yay! 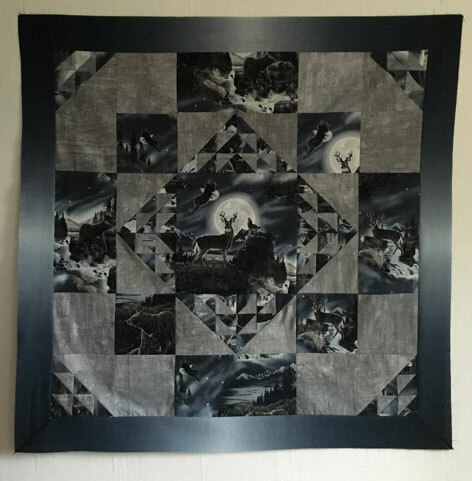 As a result, ‘Wildlife” is now pieced and awaiting a decision on a backing. I am nearing completion of the Basic Dyeing for Quilters class of Elizabeth Barton. 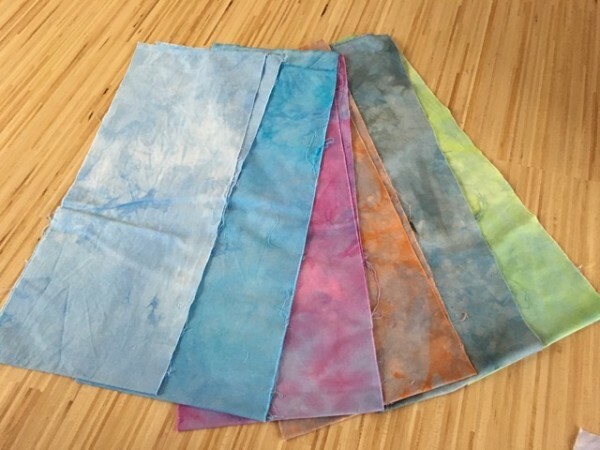 I have gotten a tremendous amount out of the class and am truly appreciative of Elizabeth’s efforts to create a user-friendly guide for those wishing to learn more about dyeing fabrics. I continued to explore over-Dyeing this week with two objectives. To explore the range of changes when one over-dyed with different colors, and to create some less intense lighter fabrics. I chose to work from a base of Basic Blue and overdye with a number of other dyes we used in the class. Much to my delight, my results achieved my goals! Left to right: Basic blue, overdyes of turquoise,fuchsia,orange,black, yellow. It has been a good week…more to look forward to next week. I am very aware that I have the entire issue of photography to address. Next week? We will see. Linking to Nina Marie’s Off the Wall Friday blog, as always. the quilt is fabulous Judy!! Any new yet about you know what??? I am too nosey for my own good…lol…. Both the quilt and the over dyes look terrific. The second “halo” really draws in the viewer, I think – it adds a frisson to the quilt and gets the eye moving around. Looking forward to seeing what happens with the quilting. You have some fantastic dyed pieces there! The Birds in the Air is amazing! Those specialty feet really do improve quality of stitching. Your dyed fabrics are lovely, too.